Problems with sewer pipes at the new Wembley stadium will not delay its opening, the construction firm said. Australian firm Multiplex said work to repair the underground pipes would not affect the completion deadline for the £757m stadium. Pipes running beneath the 90,000-seater arena in north-west London have buckled due to ground movement. Multiplex is due to give an update next week on the progress of the project which has been beset by problems. On Monday, 3,500 workers were sent home on full pay after a beam fell, costing the construction company an estimated £500,000. A Multiplex spokesman said planned CCTV camera surveys of all the drainage systems are being carried out and "any recommended remedial works will be carried out by the appropriate sub-contractor". "We do not believe that the drain and sewer system remedial repairs will have any impact on the completion of the stadium," he said. Steve Kelly, of the GMB union, said it appeared that the problem had been caused by pipes not being properly laid. He said: "When the pipes are laid, they have to be supported properly underneath, especially where they join" and "it doesn't appear as if this happened. "Apparently they are now going to have to dig up the pipes and repair them but that is a process that is going to take months." The original completion date of autumn 2005 was moved back to January 2006 and then 31 March. 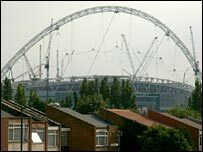 Last month it was announced the stadium would not be ready for the FA Cup final on 13 May.